Mrs. William Meuse and her son Jim, who were burned out of their Spruce Street home, spole with Mayor Philip Spelman. Fire Chief Herbert Fothergill hovered in a helicopter over Chelsea in 1973, watching flames engulf 18 blocks of the city. A fire alarm was struck at 3:56 p.m. on Oct. 14 for a blaze that began on Spruce and Summer streets, and to firefighters’ dismay, it wasn’t letting up. Fothergill radioed commands to his crews, who were able to quell the conflagration after a tenacious 24-hour battle, recalled the chief’s son, Chuck. Miraculously, no one died in the Great Chelsea Fire, but it destroyed 300 buildings and homes and displaced 1,000 people. It took days before firefighters fully extinguished the smoldering remnants. A cause and monetary damage were never determined. Now, the 40th anniversary of the spectacular fire brings memories of lessons learned. Chelsea had suffered from an even greater fire in 1908, and rebuilt without adequate precautions, officials have said. 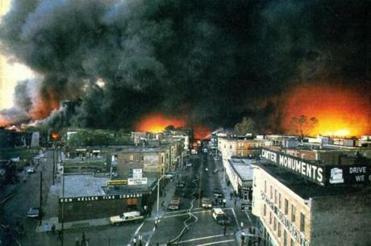 After the 1973 fire, the city revamped its zoning laws to prevent another fire of that magnitude. Both fires occurred in Chelsea’s “rag shop district,” cluttered streets filled with junk shops hawking scraps, metal, and combustible items. Wood-frame buildings and three- to six-family houses were built tightly together. About 4 p.m., Herbert Fothergill’s wife called him in from the yard, Chuck recalled. The large radio in their kitchen announced a second alarm. Then, a third. Winds swept up sparks and embers, igniting small fires across the city. Buildings spontaneously erupted, Addonizio said. Even City Hall caught fire, forcing the mayor and other employees to evacuate. More than 60 Massachusetts fire departments dispatched crews to assist Chelsea. From the helicopter, Herbert Fothergill pinpointed how to slow the blaze. He ordered firefighters toward the Williams School and had them direct a wall of water at the fire. The water began to subdue the flames, his son said. The aftermath resembled a bombed city during World War II, Fothergill recalled his father saying. Chelsea revamped its zoning laws after the fire, barring businesses and residents in the area from rebuilding. The rag shop district had already been a part of an urban renewal plan, which was then updated for fire safety. For Herbert Fothergill, the conflagration was the highlight of his 42 years as a Chelsea firefighter, his son said. 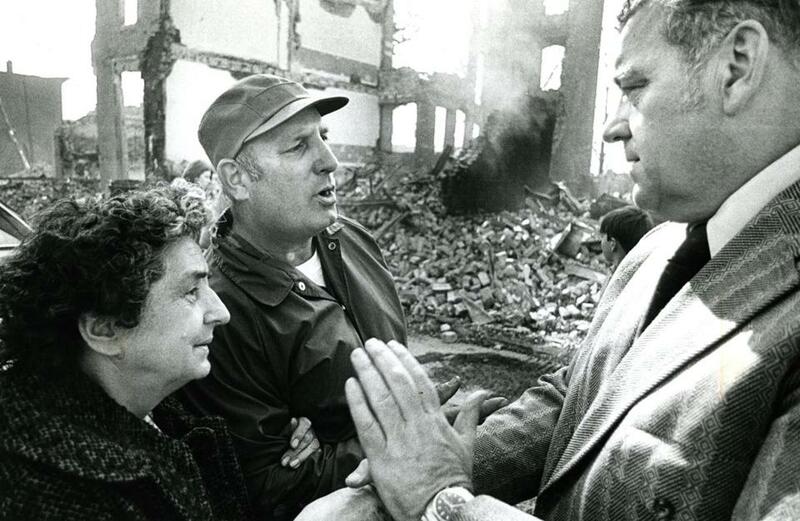 Even 40 years later, residents still reminisce about the towering flames. “Firefighters did a remarkable job that day in that there were no lives lost,” Addonizio said. Melissa Hanson can be reached at melissa.hanson@globe.com. Follow her on Twitter @Melissa__Hanson.